Posted March 27th, 2019 by Tim Cheeseright & filed under Software. Posted February 27th, 2019 by Tim Cheeseright & filed under Software. Last year we discussed our research aimed at re-imagining molecule design to bring the best of 2D and 3D technologies together in a collaborative environment. The project, code-named TorchWeb, has progressed significantly and is now on the count down to a beta release, expected in the early summer of this year, with an initial release to follow in the autumn. The web-based interface contains plugin windows with key information. 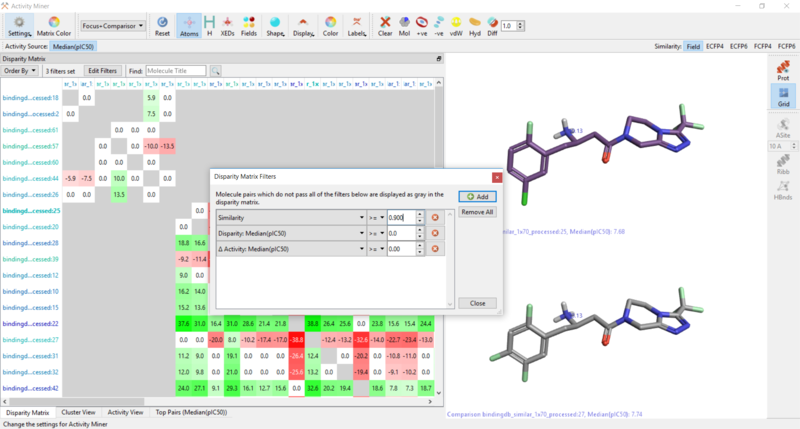 Here, in addition to the ‘Editor’ and ‘3D viewer’ plugins I have: the ‘Designs’ plugin that shows all the molecules that I am currently working on; the ‘LogP’ plugin giving an atomistic breakdown of the calculated logP; the ‘Properties’ plugin showing mutiple physico-chemical properties; and the ‘Similarity search’ plugin that shows similar molecules from a chosen database. 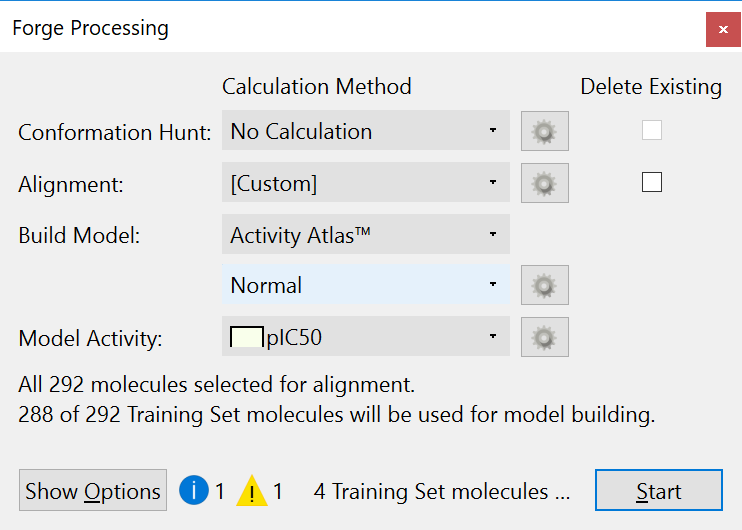 Firstly, we want to create an environment where medicinal chemists can draw molecules in a 2D editor, have these automatically converted into a 3D model of how the new molecule would interact with their target, or compare to the molecules that they have made before. 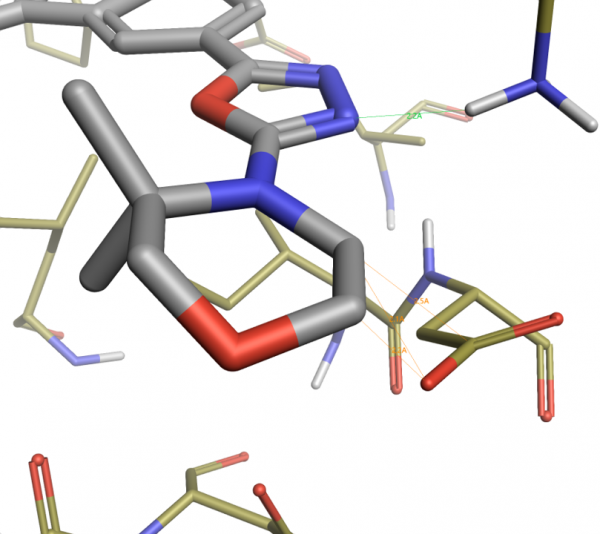 To do this we created a new algorithm to grow molecules in 3D which is applied to every change in the 2D molecule. 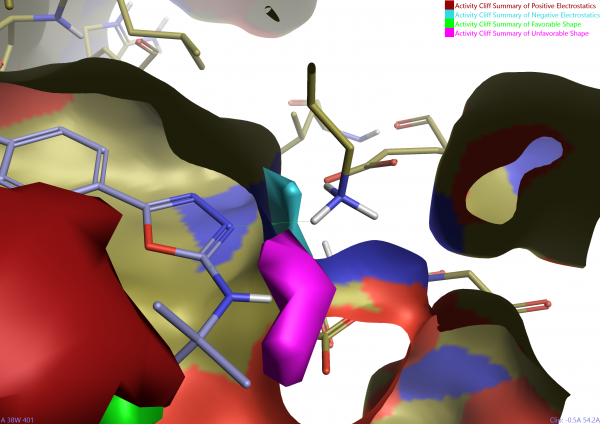 The 3D pose of the molecule is updated interactively as the molecule is sketched in the 2D window enabling immediate assessment of the potential interactions that could be made by the new molecule. All other plugins also update, giving live similarity searches and logP predictions. Secondly, we recognize that medicinal chemistry designers often work in teams across multiple locations and time zones. Consequently, collaboration had to be central to the application. This has been achieved through session sharing – enabling multiple users to share and simultaneously interact with a design and work on them together. Joining a shared session enables users to collaborate live on any design, updating the 3D pose and chemical properties as the molecule evolves. We are working steadily to convert our initial prototype into a full product. Collaboration with selected customers has enabled us to capture detailed requirements and to transition the code base into a robust, secure environment suitable for on-premise installation or deployment in the cloud. Features have not been ignored! The design application will be joined by a data analysis application that will combine eye catching plots and graphs with 3D protein active site analysis. Once designed a molecule still has to be made. Here we have embarked on a partnership with Elixir Software’s chemTraX. 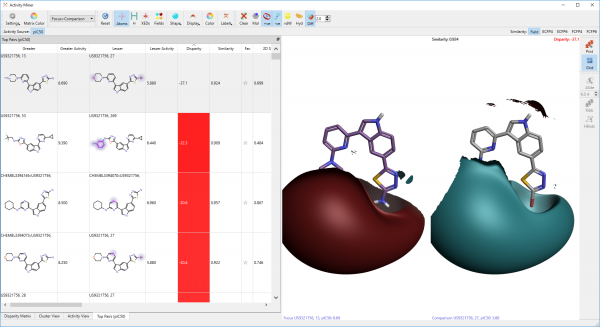 Together we will provide real time understanding on the status of every molecule from design to analysis, so you only make the molecules that you need to reach your goal. Want to be among the first to learn more? Posted January 30th, 2019 by Tim Cheeseright & filed under Software. Posted October 31st, 2018 by Tim Cheeseright & filed under Software. In a presentation at the Cresset User Group Meeting in 2016, Nik Stiefl and Finton Sirockin from Novartis discussed the selection of building blocks for DNA encoded libraries using electrostatic and shape diversity as the key descriptor. This work was powered by a custom binary and scripts written by Cresset. Over the last couple of years this approach has been applied to a wider range of library designs and has gained a reputation as a method of choice for many library designs. 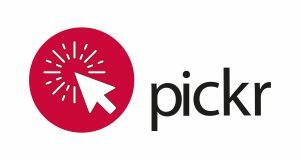 PickR will be a new tool that formalizes the approaches that we developed in collaboration with Novartis. It is a command line binary that provides a diverse pick of reagents to be incorporated into a library. Unlike other approaches, PickR uses the electrostatic and shape properties of molecules to generate the descriptor matrix that is used as the basis for the diversity pick. Generating diversity using a 3D property is not straight forward. It is necessary to explore conformations of R-groups and rotate them about the proposed connection point in order to fully understand the distribution of properties. Much of this was well described in Nik and Finton’s presentation (slides 12-15). I will leave a formal discussion to the final release announcement. I applied a dataset of approximately 1,000 amino acids that can be purchased from eMolecules. The raw reagents were processed to convert the side chains into R-groups with the C-alpha atom being converted to Iodine (all other Iodine containing reagents were excluded as were those containing Br and those with side chains >150Da). 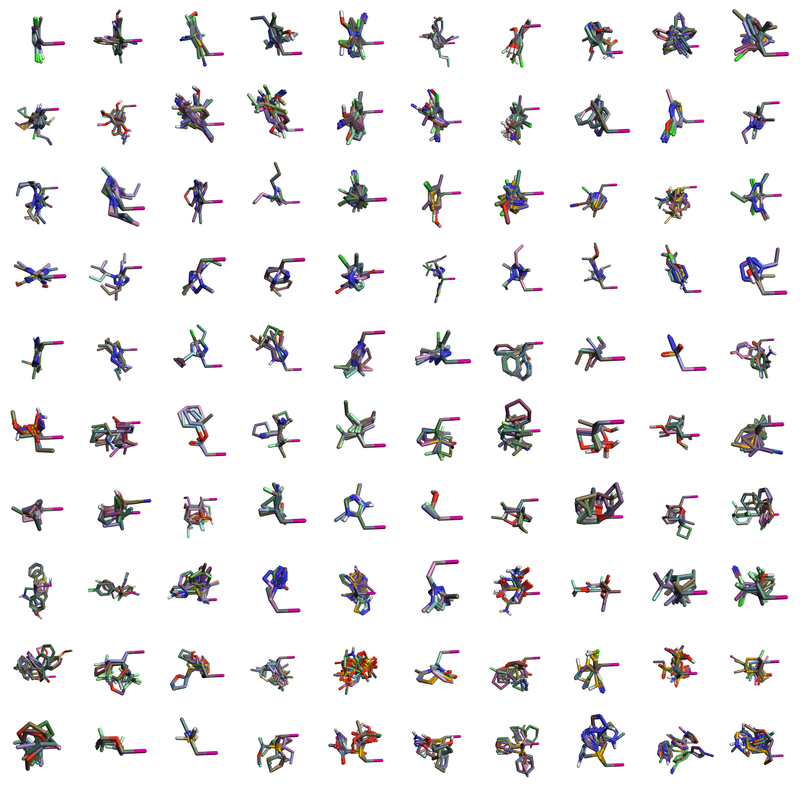 Using PickR, I generated a 3D similarity matrix for the side chains, aligning on the C-alpha to C-beta bond. 100 clusters were requested initially. 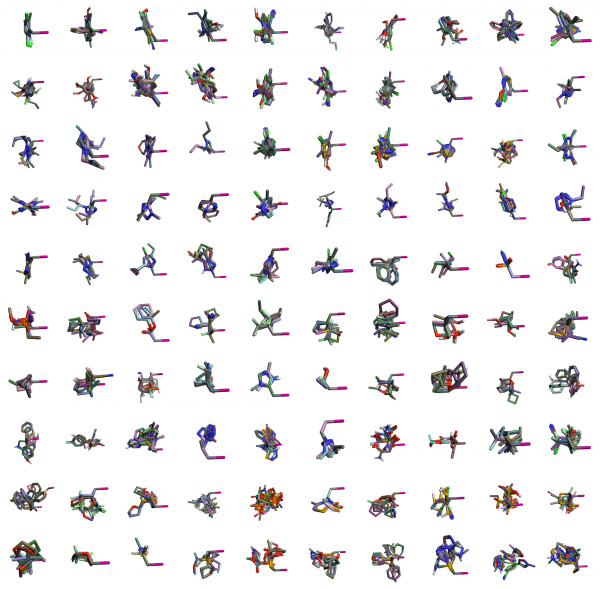 3D representations of all 100 clusters generated from amino acid side chains, aligned to each other using the I-C bond of the fragments. Looking at the results, there are some very nice relationships. For example, in Cluster 2, together with tyrosine, are other phenolic side chains but also an indazole that contains the donor-acceptor motif. 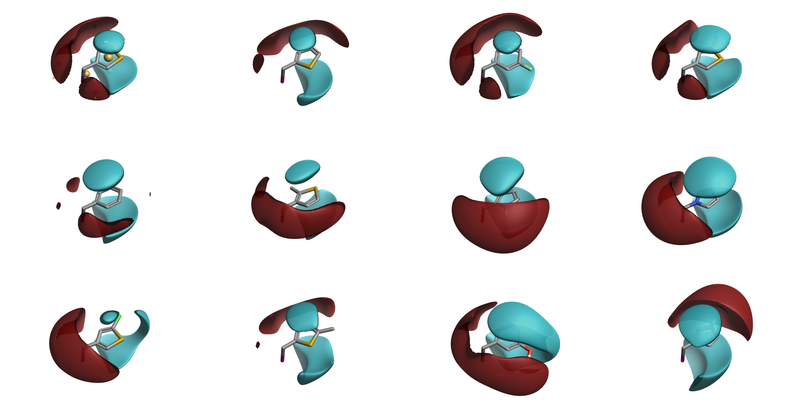 2D representations of all the side chains in the same cluster as tyrosine (highlighted). Along with the indole of trytophan are other substituted indoles, pyropyridines and benzofuran. In with the isobutyl side chain of leucine are a number of cyclic analogues which I expect would cause issues with many 2D similarity methods. 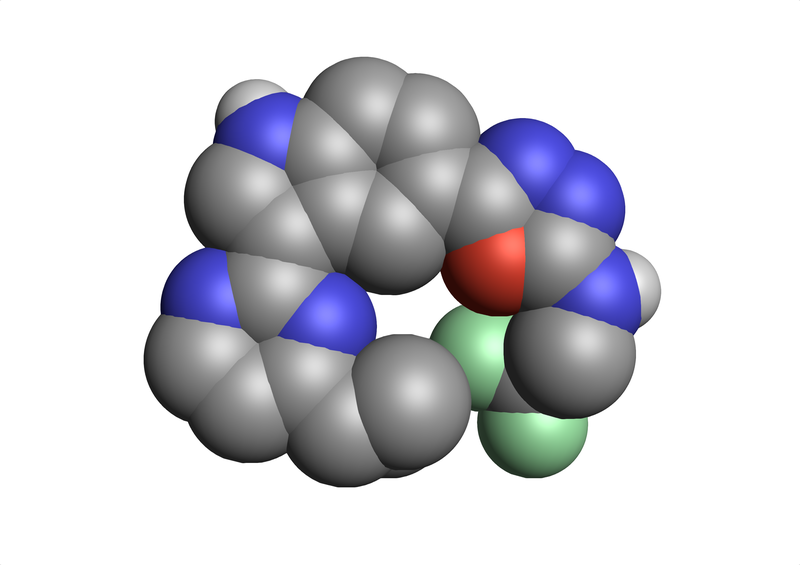 Interestingly, indoline is placed together with the equivalent of homo-phenylalanine. 2D representations of the leucine related cluster. 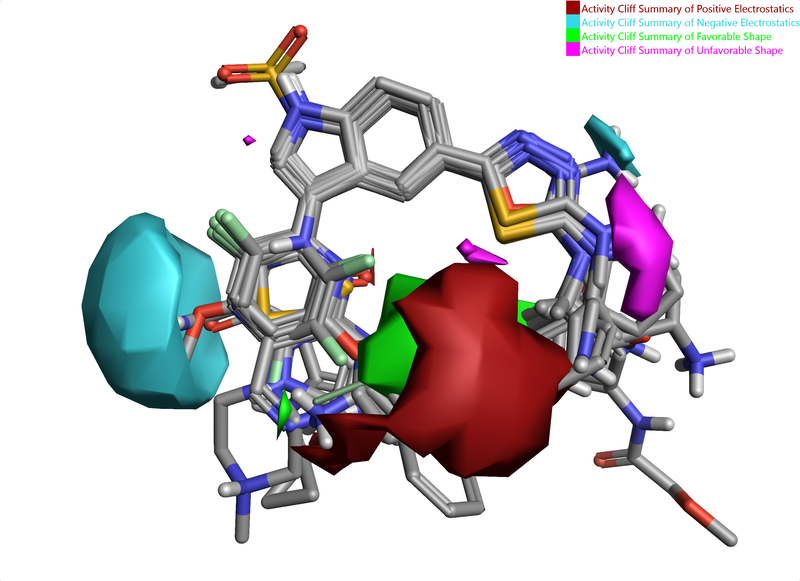 The cluster containing the phenylalanine side chain highlights the major difference of PickR over other methods – R-groups are clustered on 3D electrostatic properties. Hence, together with the phenylalanine side chain you have thiophenes and pyroles but few other aromatics – pyridine and pyrimidines go to their own clusters because using electrostatics they are quite different to a plain phenyl ring. Contact me to receive the full results in a Forge project file. Contact your account manager if you are interested in learning more about PickR. Posted September 27th, 2018 by Tim Cheeseright & filed under Software. In a recent blog post Pat Walters nicely used the structures of Viagra and Cialis when bound to PDE5 to argue that scaffold hopping between these two drugs was not a task that could be performed easily. He used Python to demonstrate that each drug interacted with siginificantly different parts of the protein and that they only shared interactions with 4 residues. Inspired by this, I sought (with the help of Paolo Tosco) to implement Pat’s code in Flare. Paolo has been working on the implementation of a Jupyter notebook within Python (see his post here) and this provides the ideal environment to implement and discuss code to explore the common and specific interactions of Cialis and Viagra with PDE5. The notebook contents are shown in the iframe below. If you would like to learn more about Flare and using Python to customize, script or automate common actions or you would like to try the code out for yourself then please contact us. The current range of Python extensions for Flare are avaiable from our GitLab repository. Posted May 29th, 2018 by Tim Cheeseright & filed under Software. Flare V2 is in the final rounds of testing, which means the release announcement is imminent. Ahead of the user group meeting, where we will be presenting this major advancement, this post takes a sneak peek at some of the new features in this version. Completely rewritten surface generation code results in faster and better surfaces with quality options built in to the surface creation dialog. This is combined with new coloring options for new surfaces to give you more insights into your proteins and ligands. Figure 1: (a) New surface coloring options in Flare V2, and (b) PDB code 4MBS with a hydrophobic surface colored yellow (hydrophobic) to blue (hydrophilic). Making pictures is key to communicating your insights on protein-ligand binding. Flare V2 has major improvements to the Z-clipping to enable you to get the view that you want. In addition, to apply a specific clipping plane to an individual surface, you now have the option to exclude ligands from the clip altogether. This option makes a significant impact on pictures of binding sites that are completely buried. Figure 2: PDB 1IKW showing the ability to selectively clip proteins. (a) Ligand clipping often makes it difficult to get the picture you want whereas (b) disabled ligand clipping in Flare V2 gives you more options to communicate key insights. Figure 3: Flare V2 gives the option to clip individual surfaces independently of other objects. 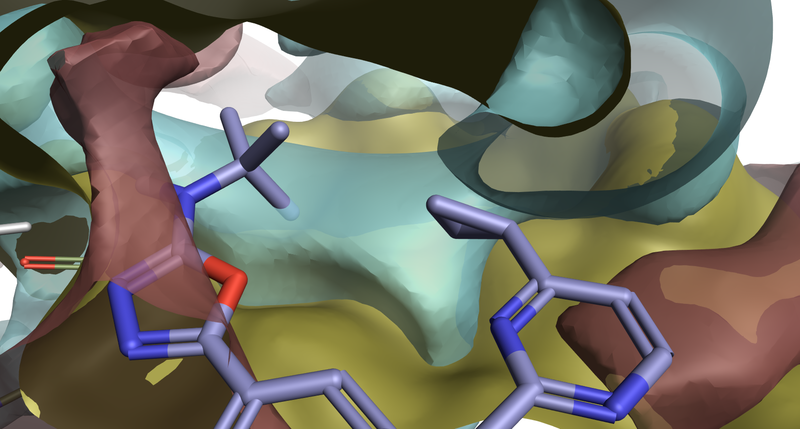 Here a clipping plane is added only to the electrostatic surface enabling the visualization of protein residues that are above the ligand in combination with a surface. 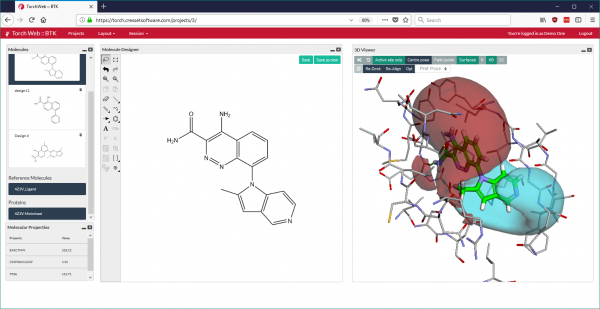 The new protein surfaces are complemented by new options for ligand surfaces, the new storyboard panel to capture and replay key 3D insights and many new features for ligands. Taken together with the Python API this release of Flare is a major advancement in this innovative new application for structure-based design. Register for the up-coming user group meeting to find out more about Flare V2, network with existing users and receive free training at one of the hands-on workshops. Posted April 25th, 2018 by Tim Cheeseright & filed under Software. 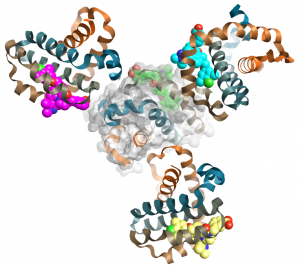 Molecule design is a central task in drug discovery. It is both personal and collaborative, easy to do in 2D (on the fume hood or using a drawing application) but more productive when combined with the 3D environment of the chosen target. We have been thinking about how best to provide you with a molecule design application that satisfies all these requirements. Whilst Torch has many favorable attributes that make it a popular choice, it cannot satisfy the two key features that you request of it – to be able to sketch in 2D in a popular drawing application, and to work in a collaborative environment. Project TorchWeb is now underway to satisfy these requests. This project will deliver our next generation of molecule design application and, as the name suggests, will be entirely web based. We have recently completed a proof of concept application, part funded by a UK government grant, and are delighted with the two key technologies it has at its heart – the ability to work exclusively in 2D and yet have the 3D context of your design immediately available, and the option to share your work ‘live’ with one or many collaborators. 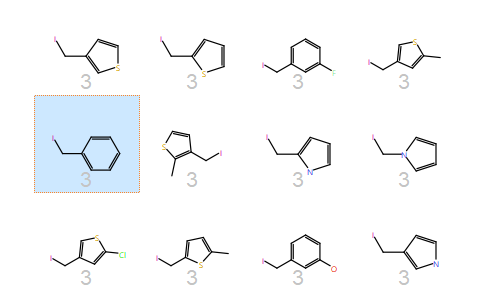 TorchWeb reimagines the molecular design process within a web browser. Using 2D and 3D representations of the molecule together with Cresset’s electrostatic descriptors gives an detailed view of your new design. As chemists we are taught to synthesize molecules using 2D representations. This makes our life simplier, condensing complex situations down to a 2D language that we use to think about and communicate our ideas. However, molecules are 3D and exert their effects in 3D. Why do we not link these two using the computer to extrapolate our ideas from 2D to 3D automatically? This is the philosophy behind design in TorchWeb. 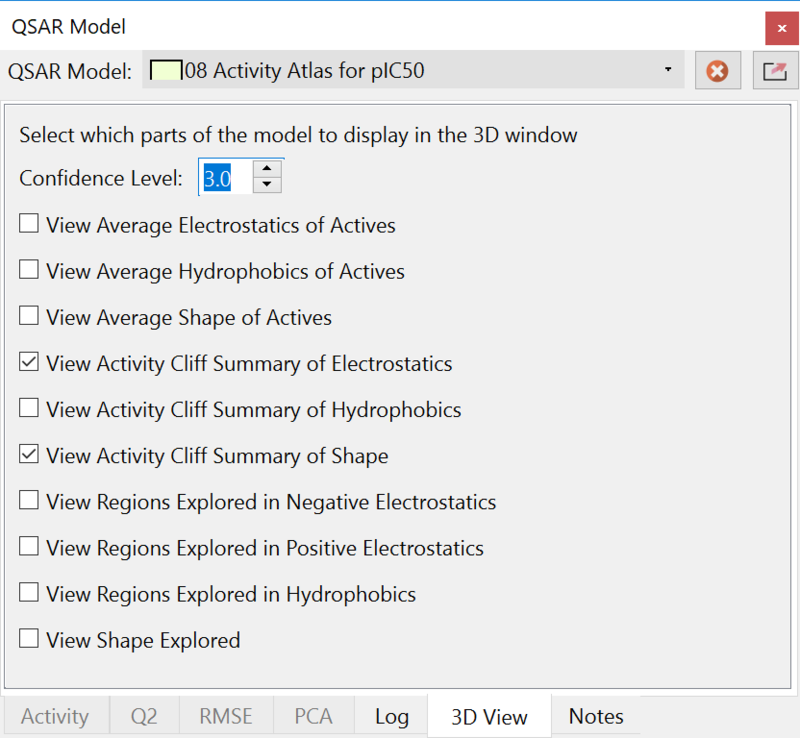 Changes in the 2D window are automatically interpreted into 3D. Modern drug discovery teams are often geographically diverse, both within a single company and across multiple organisations. In TorchWeb we have developed a collaboration layer that enables you to invite other users to share your current design environment. We aim to remove artificial barriers to working with others in your team, catalyzing new ideas, stimulating new thoughts and focusing on current challenges. Sharing a session gives a collaboration platform where ideas can flow between users without restrictions. Once released we hope that TorchWeb will enable medicinal chemists to make the best, most informed decision at every stage of the discovery process. In part this is due to the core Cresset technologies but also because of the web based nature of the application. Central to the design of TorchWeb is the ability to extend the application through plugins or custom windows that can provide real time feedback on new designs at the moment of conception. 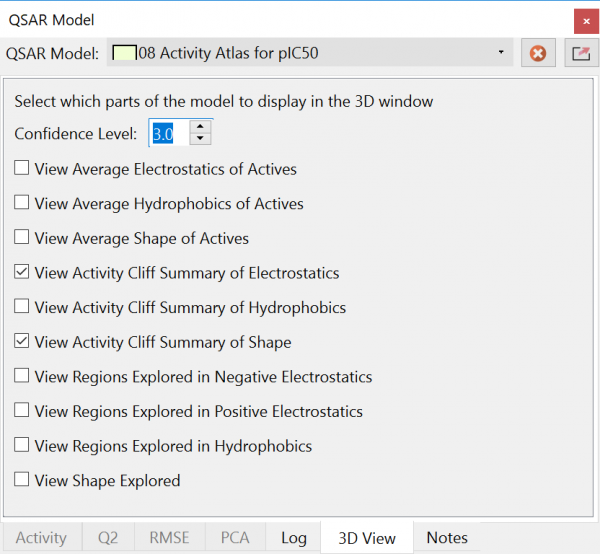 This will allow you to bring all of the insights available from your existing QSAR and QSPR methods into the design process. We are actively developing TorchWeb and are aiming for launch in 2019. As with our desktop applications, we are keen to gain feedback from our customers to ensure you receive a product that works for you. Whilst it is not ready for testing just yet, we will announce alpha and beta test programs in the coming months. In the meantime, if you would like to know more about this exciting new application then please do not hesitate to get in touch. See a demonstration and hear more about the core algorithms behind TorchWeb – register for The Cresset User Group Meeting on June 21 – 22, 2018. Posted March 27th, 2018 by Tim Cheeseright & filed under Software. Modern structure-based design encompasses hundreds of methods, advanced algorithms and diverse biological targets. 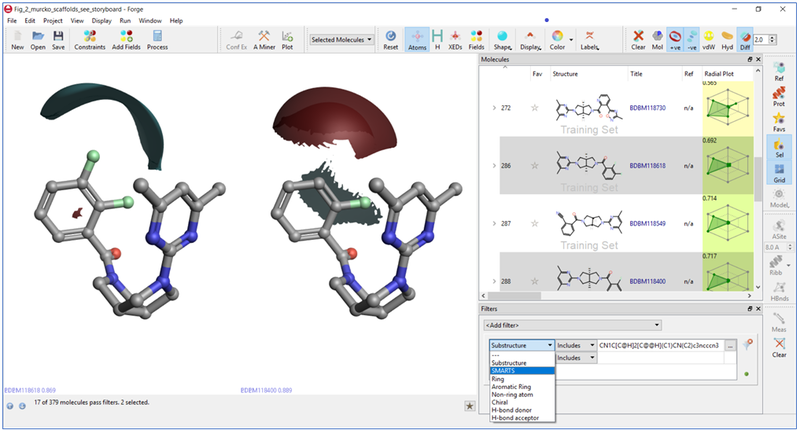 Cresset has a long-standing reputation for easy to use applications in the ligand-based design sphere. In deciding to bring Flare™, a new structure-based design application, to the market we created a challenge – can structure-based design be made simple? Usability and flexibility are such fundamental features of well-designed software that they are often only noticed when they are absent. Usability reduces frustration, reduces training overhead, and makes it easier to access the full potential of the software. However, users also want the flexibility to tweak experiments, perform complex workflows and customise their applications to work the way they do. These key ‘unspoken’ features have been part of the design process in building Flare from the very start. Critical to any analysis is the use of your conclusions to change the future. In structure-based design this means using information on how ligands bind to proteins to influence the design of the next ligand. In Flare we have put ligands at the heart of the application. They are stored in their own table and have a dedicated tab menu. The table layout enables physico-chemical property data to be stored alongside each ligand or calculated for every new design. It enables you to organize your compounds (sorting ligands based on their properties) or split ligands into different groups (roles) so that you can break down larger datasets into manageable chunks. Designing new ligands is easy using the simple ‘Edit a copy’ feature. 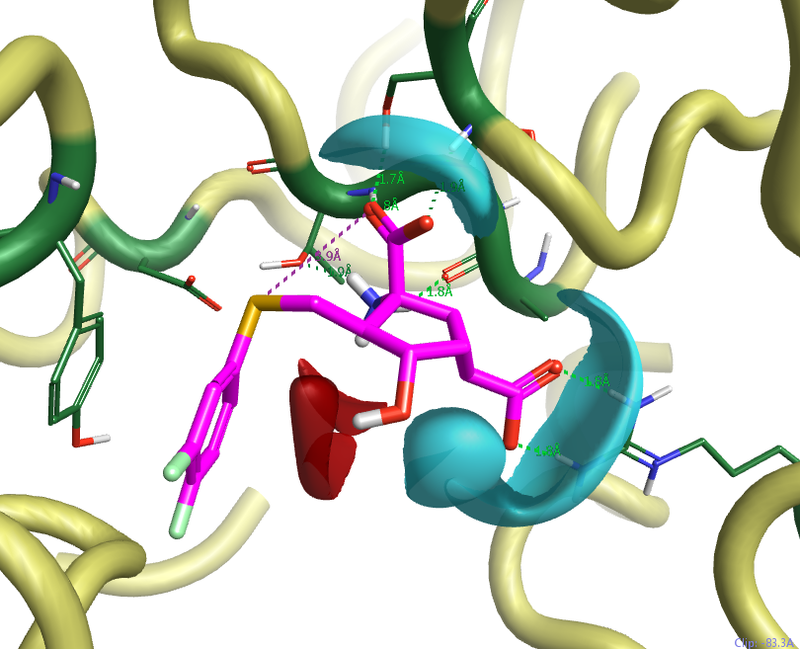 This brings up the molecular editor where the ligand can be improved in the protein active site and in reference to other ligands. The combination makes it easy to design in 3D, gaining all the productivity benefits that this brings. Sequential edits give an iterative process where each new design can be analysed and used as the basis for the next design. Analysis of existing or newly designed ligands requires complex methods. From docking to a detailed energetic prediction of binding, structure-based design methods are all complex. The challenge here is to present complex methods in an accessible way that enables expert users to modify key parameters but is not daunting to the regular user. In Flare a standardised layout is used for all calculation dialogues and provide default settings that work well in most cases. Experts have the choice to take the defaults or progress to the Advanced Options to change the parameters to meet their needs. Creating great pictures is central to structure-based design. It seems like no J. Med. Chem. 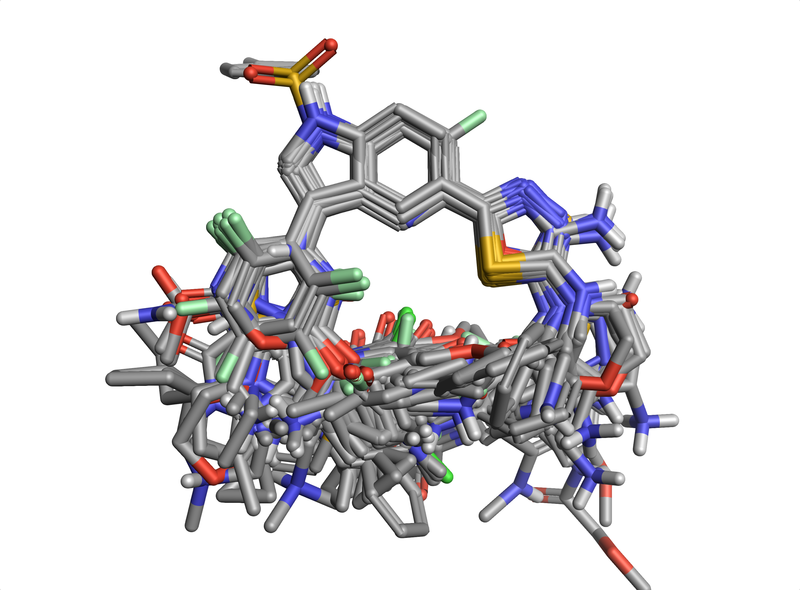 Article is complete without at least one protein-ligand picture. Creating pictures in Flare is easy with control over every aspect of the 3D display straight from the Home tab menu. Add to these the ability to control the clipping planes of surfaces independently of atoms and bonds and control over the picture resolution and you have all the elements you need to make stunning pictures. Whether for internal presentations, print articles or large posters, Flare delivers the quality of picture that you need. The feedback that we have received on the usability of Flare has been very positive. In the next release, you will see even more usability features such as storyboards, improved ligand selection and enhancements to the drag and drop features. We want Flare to be the best structure-based design application you use, so share your experience with us. 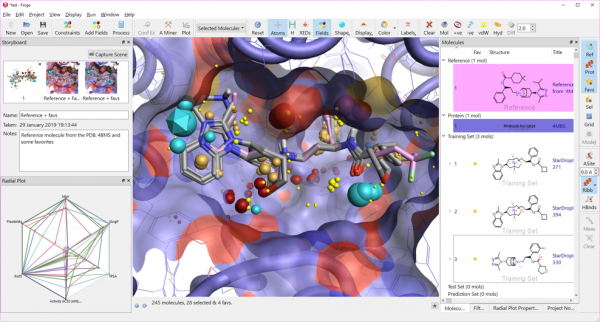 Request a free evaluation of Flare to see for yourself just how accessible structure-based design is for computational, medicinal and synthetic chemists. Each month we release updated Spark databases derived from eMolecules’ building blocks. These have proved very popular with our customers. This month a small change is being made to the databases in that we now only include reagents that are in eMolecules’ Tiers 1, 2, and 3. These correspond to the most accessible reagents and should be a good source of inspiration for R-group design experiments in Spark. The number of reagents that are now listed as available has grown significantly. In the last couple of months we have been processing around 650,000 reagents but this month that number is close to 1.1 million. Unfortunately the majority of this increase is in eMolecules’ Tier 4 category with availability in the multiple-weeks time frame. We felt that these additional reagents were largely noise in the majority of Spark experiments. As a result we have slimmed the downloads, search times and results by only including Tiers 1, 2 and 3. These still encompass 295,000 reagents and hence provide you with an excellent source of readily available R-group bioisosteres. If you are interested in the Tier 4 reagents, please contact Cresset support to discuss the options. Installing the Spark reagent databases is easy using the built in Spark database update facility.